For your convenience, Grande offers several great ways to pay your monthly bill. Choose the one that's right for you. 1. Make your payment online. You can pay your Grande bill right from your computer by accessing your MyGrande account. Simply register for a MyGrande Account online to view and pay your Grande bill. You can make one-time payments or set up automatic monthly payments directly from the checking account of your choice. Note: A payment processing fee applies to one-time payments. 2. Make your payment through the new MyGrande Mobile App. With MyGrande mobile app, you can manage your existing MyGrande account anytime, anywhere. Just visit the Apple iTunes App Store or Google Play Store to download our FREE MyGrande app. With the new MyGrande mobile app, you can not only pay your Grande bill right from your mobile phone, you can also update your account information, view current and previous statements, check voicemail for all phones on your account, and review your call history for all phones on your account. Internet access is required to use the MyGrande app. 3. Make your payment through our automated phone system. We accept one-time credit/debit card (Visa, MasterCard, Discover, and American Express) payments via our automated phone system at 1-877-647-2633 or via a Customer Service Professional. Note: Convenience Fees apply. 4. Make your payment by mail. You can pay your Grande bill in the traditional fashion – through the U.S. mail. Grande will send you a paper bill in the mail each month. Once you receive the bill, simply return the enclosed bill stub to Grande along with your payment in the form of a check or money order. Please mail your payments to the location below. If you'd rather pay your bill in person, visit our locations and payment centers page to find a list of locations. 5. Make your payment in person. You can make your payment in person using one of Grande's many convenient payment locations. Look up a payment location nearest you. Don’t forget to review that location's business hours. Stop by the location nearest you and leave your payment with a customer service representative. Our payment locations accept cash, checks, money orders or credit cards (Visa, MasterCard, Discover and American Express). What charges will appear on my very first Grande bill? There are a number of factors that impact the amount of your first Grande statement, not the least of which is the type and number of services you’ve purchased. Here are several factors to keep in mind when reviewing your first Grande statement. Based on what day of the month you signed up, Grande will bill you a prorated portion of your regular monthly service charges for the current month. This applies to cable TV, phone and Internet services. Charges (if applicable) for services like Pay-Per-View or Video On Demand, if purchased within the month, will also appear on your first statement. What taxes and fees does Grande add to my bill? Taxes and fees charged to customers vary based on the services you are purchasing the state or local region in which you live. The Network Access and Maintenance Fee helps defray costs associated with building and maintaining a fiber rich broadband network, as well as the costs of expanding network capacity to support the continued increase in customers' average broadband consumption. Click here to create a MyGrande account for free online access to your Grande account. Be sure to have your account name, number and security password ready to sign up. Once logged on you can view and pay your bill online or if you’re mobile download our Grande Mobile app! Grande accepts payments using the app or online using credit or debit cards with the VISA, MasterCard, Discover or American Express logo and by direct debit from a bank checking account. When is payment due for my Grande bill? To avoid the possibility of incurring late fees, Grande recommends paying your bill immediately upon receiving your monthly statement. Your due date is listed on your monthly statement, on each page in the upper right hand corner. Will I be charged a late fee if I do not pay my Grande bill on time? Grande encourages customers to make timely payments to avoid late fees and possible service interruption. Grande reserves the right to charge late fees when payments are not made on time. If you are charged a late fee, you will be notified through a printed message on your bill. Call 877-647-2633 and select the option for making payment arrangements. This will put you in touch with a customer service representative who will help you settle your account. Call 877-647-2633 and select the option for making payment arrangements. This will put you in touch with a customer service representative who will help you settle your account. And yes, you will have to pay a reconnect fee for each Grande service (cable, phone, Internet) that has been shut off due to late payment and reconnected. If you have any past due balance, it must be paid in full before Grande can restore your service. Yes! Click here to create a MyGrande account for free online access to your Grande account. Be sure to have your account name, number and security password ready to sign up. Once logged on you can choose the billing method that’s right for you, look for Paperless Billing. On-the-go? Download the Grande Mobile app for easy access to view your bill, make payments, update your billing method and more! For additional information, you can visit our Customer Center. Yes! Click here for our MyGrande service. Once you’ve registered and logged on to the system, visit the Account Summary page. Then click on the “View Previous Statements” button below the current statement. You will be presented with a list of past statements. Click on the statement you want to view. Grande will keep up to 12 months of statements online. We recommend that you copy the PDF files to your hard drive for safe keeping. For additional information, you can visit our Customer Center. Yes. To pay a Grande bill for a friend or family member, call 877-647-2633 and use our automated phone system to make the payment. You will need to have the account number handy for the bill you are paying. Currently, you cannot pay a bill for someone else online. This option is only available through our automated phone system. Grande does not collect a deposit for cable TV converter boxes. Only dial-up Internet customers may pre-pay for a year of service. Grande does not currently accept pre-payments for other services. Can I receive my Grande bill in Spanish or a language other than English? Grande does not currently offer bills in other languages. If I sign up for Grande bundled Cable TV, Phone and Internet service, will the charges for all three services appear on one bill? 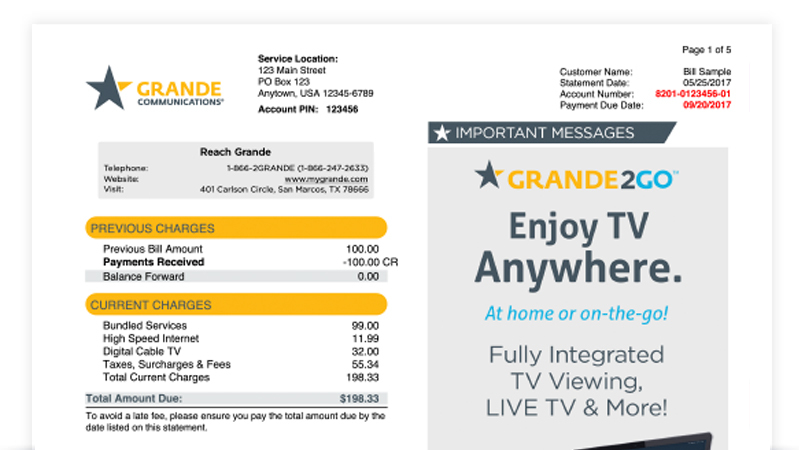 All cable TV, phone, and Internet services are available on one bill from Grande. If you have been receiving separate bills and wish to receive one bill, then call Customer Service at 877-647-2633. How do I disconnect my Grande service(s)? We're sorry to hear that you want to downgrade or cancel your service. Please contact us at 877-647-2633 so we may assist you.